It is most likely that every Latino kitchen has used or continuously uses Sazon spices in many of their dishes. Unfortunately, many of us are unaware of the formula behind this flavor enhancing blend and many of us are unaware that it is part of the cause of the high obesity and diabetes rates within the Hispanic community. Monosodium Glutamate is the main ingredient in Sazon spices. Dr. Mercola (Mercola.com) deems it “the worst food additive[s] on the market.” It interrupts the intricate system that our bodies have set to properly function. Monosodium glutamate or better known as MSG is a chemical synthesized in a lab by scientists who most likely synthesized the chemical makeup of your favorite perfume. This chemical, makes it difficult for the brain to receive messages from the hormone leptin that signals the body when it has had enough energy from food. Therefore, consuming MSG will prevent feeling full and therefore cause excess storage of fat. MSG goes further than simply weight gain. The resistance of leptin, or not receiving its messages plays a significant, if not primary role in heart disease, diabetes, osteoporosis, autoimmune diseases, and reproductive disorders. It is also considered an excitotoxin, meaning it overexcites cells to the point of damage or death and can cause brain damage to various degrees, potentially even triggering or worsening learning disabilities, Alzheimer’s disease, Parkinson’s disease, Lou Gehrig’s disease and more. Colors are food additives that should also raise a red flag. Although the Food and Drug Administration may consider many additives safe to consume, studies have shown otherwise. 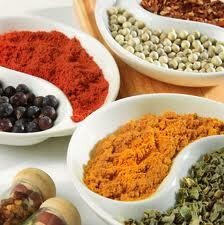 Color additives like red40 and yellow5 found in Sazon spices are highly risky to consume. They are even banned in many parts of Europe, causing chromosomal damage and is linked to ADD and hyperactivity in children. Monosodium glutamate and other food additives aren’t only hidden in Sazon spices but a lot of other non-Latino spices and processed foods. Our best bet is to always read ingredient lists, do our research and avoid them. I’m sure all you chef’s out there can synthesize special flavors in your kitchen without the help of hazardous flavor enhancers, by using the all natural herbs and spices provided by our gardens. I suggest you give it a try and you may begin noticing some positive changes in your health.